So many meals just NEED to have garlic bread as an accompaniment. A really simple garlic bread recipe is to brush slices of French bread with olive oil, toast in the oven, and then rub with a raw garlic clove. It is amazing how much garlic flavor you get on the bread with this simple trick. I love the flavor of roasted garlic in this recipe. You lose that pungent taste of raw garlic when you roast it, it almost becomes sweet. My recipe for edamame hummus gives more detail on how to perfectly roast garlic. The roasted garlic is mixed with softened butter, parmesan cheese, and chopped parsley. I wrapped up the bread in foil, which keeps it pretty soft in the center. 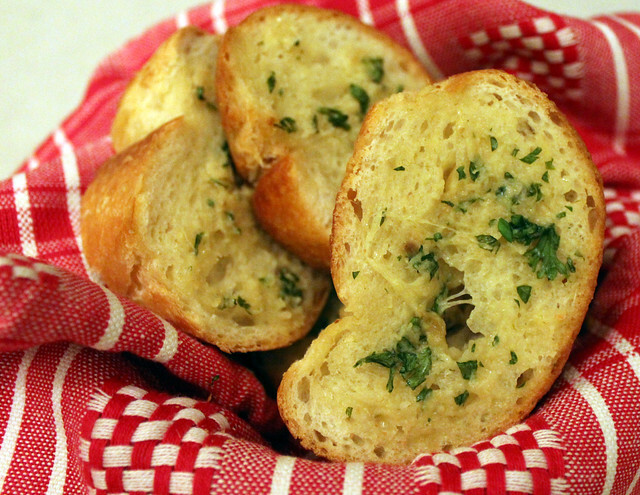 If you are a fan of crunchy garlic bread you could lay the pieces on a pan and bake until crispy. 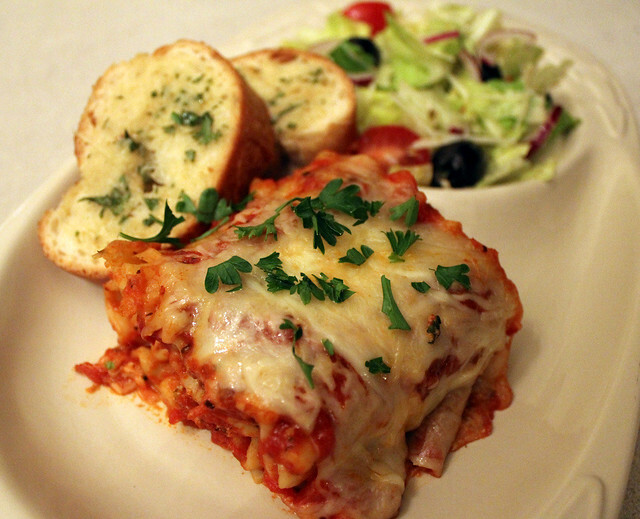 The Perfect Pairing for Roasted Garlic Bread is Spinach and Mushroom Lasagna Roll-Ups. Like I mentioned above, some meals just need garlic bread, this is one of them. There is just enough extra sauce to dip your bread. Cut the tops off of the garlic and remove any extra paper layer. Place the garlic in foil and drizzle with the olive oil. Wrap up the foil and bake in the oven for 40-50 minutes, or until the garlic is golden and soft. Into a small bowl squeeze the roasted garlic, add the softened butter and mash with a fork. Stir in the grated cheese and parsley with a spatula until combined. Spread the butter mixture onto the sliced bread. Arrange the bread back into a loaf and wrap with foil. Bake in the oven for 15-20 minutes, or until the cheese has melted and the bread starts to crisp.